Razer's big CES 2018 prototype is an Android phone dock done right. Another CES, another Razer Prototype. Unlike last year’s three-screened laptop Project Valerie, Razer’s Project Linda, announced Tuesday, is something that might actually make it to market. Project Linda is a dock for your Razer Phone in the form of a laptop. Razer’s approach might have taken inspiration from the clamshell-like Lap Dock (originally called the Mobile Extender) that shipped as an option for HP's Elite x3 Windows phone. That phone is dead, though, so Razer has an opportunity to reincarnate the idea on a more successful phone plaform. I'm optimistic: Project Linda is only a prototype, but it’s the best I've seen from Razer. 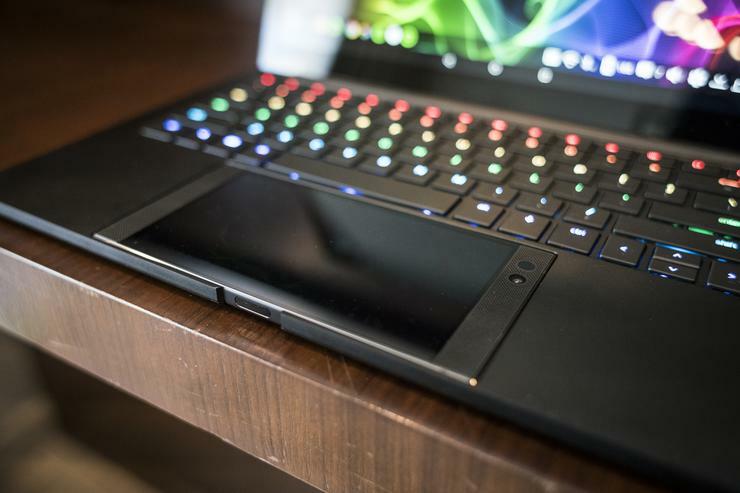 Project Linda shares the same design language that makes up most of Razer’s hardware. Because it uses the processing power of the Razer Phone, there isn’t much inside Project Linda. The form factor mimics the Razer Blade Stealth with a 13.3-inch screen, CNC aluminium chassis, and a full Razer Chroma keyboard. In order to match the screen of the phone, the display is 120Hz, 16x9, and (hopefully) Quad HD resolution. I say hopefully because the unit we saw in our meeting was only full HD. Razer said 120hz QHD displays at that size are hard to come by right now. Inside the base of the laptop is a 53.6Wh internal battery, good for charging the Razer Phone up to four times. The included power brick is small and connects via one of Project Linda’s USB-C ports. Project Linda also features one USB-A port—take that, Dell and Apple—and a 3.5mm headphone jack. Project Linda’s 13.3 inches is a great size to take on the go. The Razer Phone docks into Project Linda where a trackpad would traditionally be and is cusioned by felt. Once in place, you hit a docking button in the top right corner of the keyboard and you hear the USB-C port move into place. From there the keyboard and screen light up, with a quick Razer animation playing while it transitions. From this point on, the glass screen of the Phone turns into a trackpad for Project Linda. When you want to take the phone out, you simple hit the docking button again, wait for the click, and pull it out. 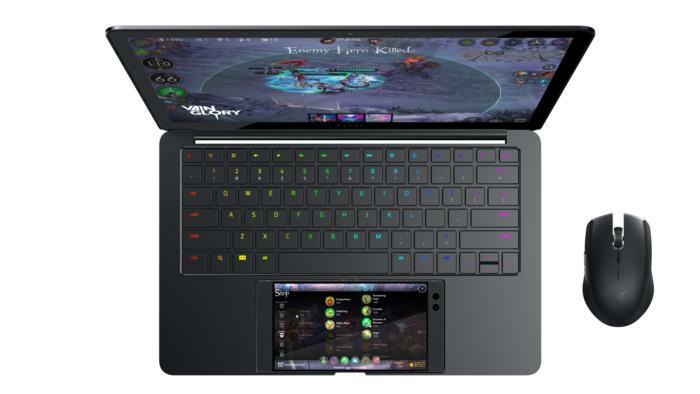 Everything in the laptop runs off of the Razer Phone’s beefy Snapdragon 835 processor with 8GBs of RAM. In our hands-on, the experience felt smooth and snappy, and it was great having the option to pair a Bluetooth mouse for finer controls. Running Android on such a large screen takes a bit of getting used-to, though. It's also worth noting that you don’t have the flexibility of a traditional desktop experience, as you do with Samsung’s Dex. Android isn’t the best OS to run on a laptop, but it sure beats typing long emails on the phone. Even though Razer's Project Linda promises an intriguing twist on the smartphone-PC relationship, there is still plenty to iron out before it can come to market. Project Linda doesn’t have any built-in speakers so it uses the dual amps and front-firing speakers of the Phone instead. I didn’t get a chance to listen to anything while using it, so we’ll have to see if your hands get in the way enough to make it a problem. There's also a notch carved out of the front of the laptop to reveal the fingerprint reader that's on the side of the Razer Phone. It wasn’t the most natural way to unlock the laptop, but luckily the reader is fast and reliable. Project Linda also packs 200GB of onboard storage, which mounts like an SD card in Android. In theory it’s nice to have that extra space if you need it, but I’m worried about the security risks if the laptop gets stolen. I’d personally jump for a version without it, knowing that if I were to loose Project Linda, I wouldn’t be risking any valuable info at the same time. Multiple window support isn't one of Android's strongest features, so the promise of a dual display might be a stretch. Another interesting prospect is dual-display support. At our CES demo the Razer Phone screen was turned off and only mirrored what was on the display, but Razer had another unit playing a concept video of how it would look if both displays were treated separately. I love the idea of being able to see extra information on the touchpad screen, which has more practical applications than something like Apple’s TouchBar. 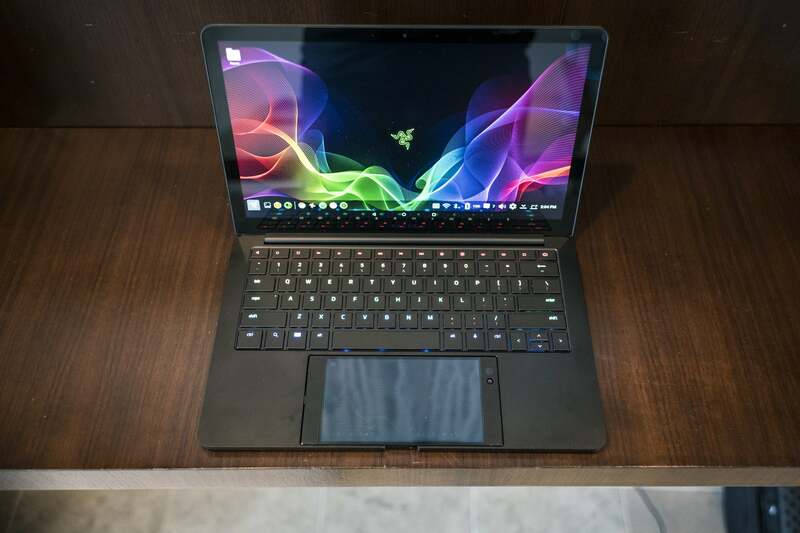 It also added to the visual flair of Razer’s design, given that most laptop trackpads are typically solid colors and blend in. Over the years we’ve seen plenty of promises of docking a phone and using it like a traditional laptop or desktop. Everyone from tech giants Samsung and Lenovo to small kickstarter projects have tried to tackle this concept to various degrees of success. I’ve always been intruged by the idea, especially lately, as mobile processing has become powerful and power-efficient. 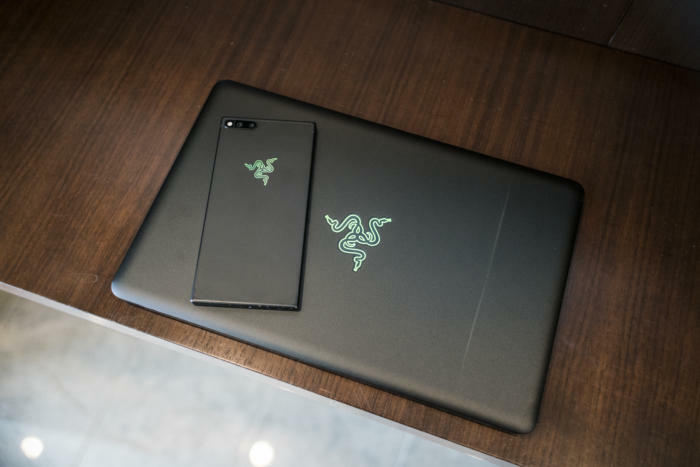 Razer might have a winning formula on its hands, with great hardware on the laptop side, and all the raw power in the Phone. Docking the phone in place of the trackpad is the perfect location, far more user-friendly than Samsung’s external Dex dock. Sure, I would never be able to do serious professional work in Adobe Premiere Pro on this laptop, but most of the time I just need something to write on, check my emails, and watch a couple of YouTube videos. Project Linda paired with the Razer Phone makes a pretty powerful duo. Will Project Linda ever come out? Like I mentioned at the beginning, we all knew Project Valerie didn’t make sense and would never come out. And while there is more for Razer to work on with Project Linda, I sense a real drive behind this product. It offers something unique to the die-hard fans who've already bought the Phone. 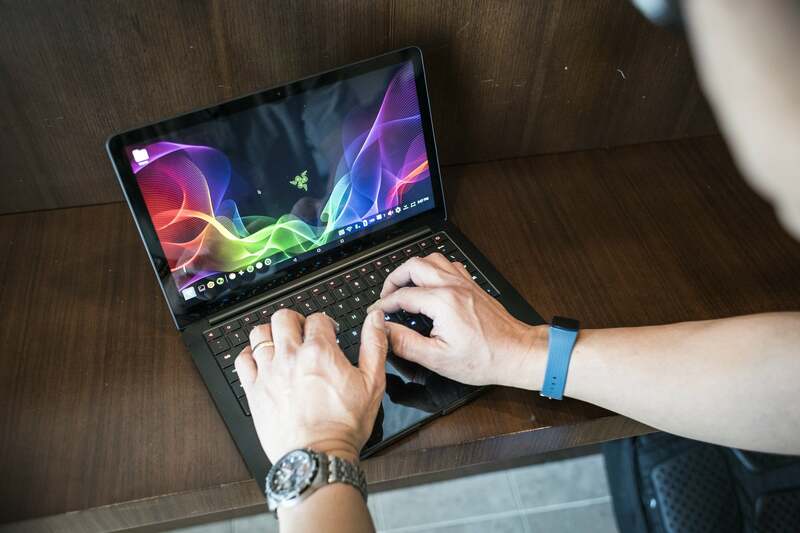 Who knows: Maybe in the future Razer will team up with Nvidia and offer GameStream on the laptop, making it an even better gaming setup. 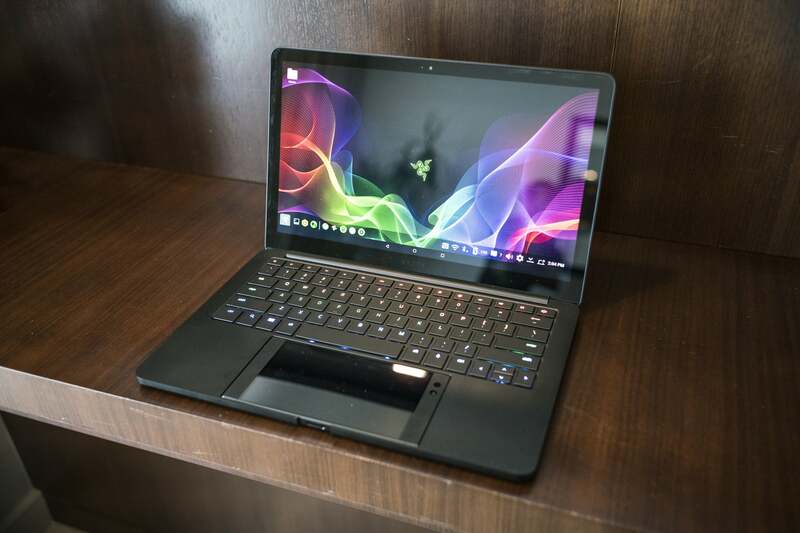 But until then I feel confident that Razer can deliver on its promise of a laptop dock sooner than you might expect.